The craft of the cottage witch conjures images of a secluded cabin on the edge of an enchanted forest. An elderly woman resides there, bent posture and warts wreak havoc on her frail form. Standing over her bubbling cauldron, she whispers incantations only the spirits can decipher. Wolves howl in the moonless night, sending icy tendrils of fear down your spine. A wisp of wind swirls around the cottage, filling the Autumn air with magic. The old woman cackles, turning about in wicked glee. The spell is cast, the deed is done—magic is afoot. Though the above scene is great for movies and fairy tales, it is not what cottage witchery of today looks like. Sure, we may have cauldrons bubbling with brew and we may cackle from time to time, but most of us are just your everyday person living in today’s fast-paced world. The magic we do in our homes are aimed toward the health and well-being of our families and community. Through spell-craft and folk magic, we enchant the world around us. We advise loved ones with day to day problems through the reading of tea leaves, tarot and other forms of divination. 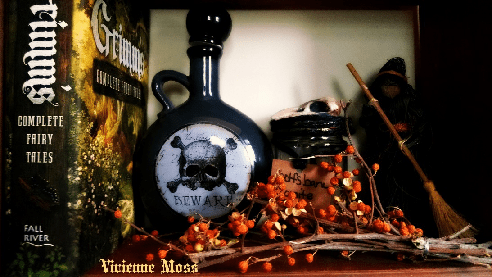 The cottage witch may honor many gods or none at all. Some work with ancestors and the spirits that live on their land. We gather inspiration through fairy tales and myth, weaving them together to form our own understanding of the occult world. Through trial and error, the cottage witch learns which potions and incantations work best her. The understanding of superstitions and interpreting omens may play a large part in the life of the cottage witch. The witch’s kitchen is where most of the magic happens. The cooking of foods, brewing of teas, and mixing of herbs and oils for spell-craft take place in what is sometimes called the heart of the home. It is where we gather at the end of a long day to discuss the events of the day. We bless our food as we are preparing it, filling it with love and health. Offerings for the House-Spirits are left here, in hopes that they protect our home and fill it with enchanting warmth. The making of poppets and witches bottles may be prepared here, the kitchen table doubling as an altar. The life of a cottage witch is one filled with enchantment. We dance through the seasons of Earth and life, weaving magic through all we touch. We laugh, we cry–we cackle. In this column, I will be discussing all of the above information and more in great detail. From folk lore to superstitions, from spells to the many forms of divination the cottage witch can utilize. House-hold deities, spirits and the Mighty Dead will make an appearance here. Join me in the making of magic, join me in– The Enchanted Cottage.